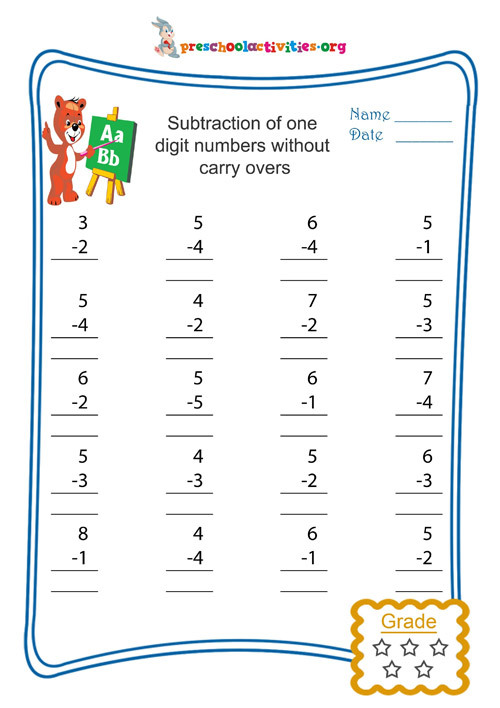 Help kids learn all about subtracting numbers without carry over with this worksheet. Mathematics can be great fun for the kids if the concepts are taught correctly at the right age. When kids learn all about numbers, the next step towards mathematical skills is learning about additions and subtractions without carry over. Kids can become skilled at these concepts with more and more practice. This worksheet aims to offer just that. It comes with several problems of easy subtraction of one digit numbers without carry over. Kids will find the page interesting, colorful and very helpful.